This is my first post and I would have liked to begin my own blog adventure writing of something nice about me and my photography. I had in mind a report from the last September, which I've entirely spent in the beautiful mountains of northern Slovakia, photographing wild Brown bears in their habitat. An intense experience of wilderness and freedom, in a large territory where these animals can still roam undisturbed. Nevertheless I feel the urge to write about something I thought could not happen anymore; something, which I, as nature enthusiast, find at the same time unbelievable and terribly shocking. On the 2nd of October and in the following days, three Marsican brown bears, a male and two females, and two wolves have been found dead in an area of the Abruzzo National Park, Central Italy. The animals have clearly been killed by a poisoned bait (a dead goat) strategically placed in the forest. This is just the last in a long series of episodes of its kind in the history of the relationship between Man and Bear in this sector of Italy. The history of an ancient and unique coexistence in a rough and beautiful region, where a small population of bears (possibly an endemic subspecies) lived for millennia in the close proximity of humans and their agro-pastoral activities. A cultural "coevolution" of these two species, severely compromised in the last century, wich makes this area of lymestone peaks and vast beech forests worth of an exceptional conservation effort. The loss of three individuals for a population of just 30-50 animals of this endangered subspecies represents a true ecological disaster. 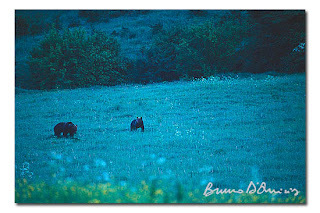 Moreover, this episode touches and affects very deeply all the people, who like me, come from this region of Italy and had the extraordinary privilege of observing these rare bears, free in the beautiful and fragile Apennines landscape. A sense of deep sadness and schoking confusion pervades me as if I had lost a very close friend. One of the three killed bears, a large male named "Bernardo" (on the left in the above image, which shows it together with a female, May 2003), was a quite famous animal living in the western part of the protected area, showing a distinct synanthropy in its feeding behaviour with a taste for chickens and other livestock in the villages. Despite the problems due to the attacks to domestic animals, its fame came from its visibility in spring, which allowed many enthusiasts to observe its movements in the lushing green meadows on the look for a mate and, then, glimpse even the most intimate moments of a bear life. That is something many people of all ages and different countries had the chance of witness and won't forget. The public opinion, once in a while, is one and angry. The Italian section of the Worldwide Fund for Nature called for a 10,000-euro bounty to be put on the heads of the perpetrators. There's also a petition to ask for a reinforcement of the regulations concerning handling and purchase of poisonous and dangerous substances: you can sign online here. May this be the very last episode of its kind! May the culprits truly pay for what they've done and live forever with a sense of guilt! May these bears have finally the freedom, the tranquillity and the protection they deserve! 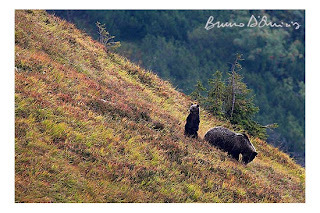 The one below is an image from my last trip to Slovakia and shows a large female with one of her three cub feeding on blueberries just above the treeline. The autumnal colors and a stormy afternoon light gave to this rare scene an almost painterly look. I dedicate this picture to the memory of Bernardo and all the other bears killed by the ignorance of Man.